Honey Moon borrowed a family heirloom – a locket – from her mother, and during a sleepover with friends, it’s gone missing. Honey must solve the mystery of who took her locket, while hiding the fact that she took it from her mother. The evil Mayor of Sleepy Hollow encourages Honey to deceive her mother, but it’s Shiver, a new town resident and owner of a unique popsicle shop that helps Honey the most. Kids will enjoy Honey Moon Shiver for the mystery, for the spooky factors of Sleepy Hollow, and the descriptions of the unique popsicle that Shiver makes. They will relate to the everyday situations with friends and family and the unique artwork. There’s a lot in this book to open conversations: lying, borrowing, forgiveness, and more. There’s a very typical circumstance where someone who is forgiven doesn’t want to forgive someone else, and who wants someone else to have the same consequences. Really great teachable moments. Highly recommended. Great adventure/mystery for middle-schoolers and conversation opener for teachers and parents. Honey Moon is in a terrible pickle. She borrowed her mother’s precious silver locket without permission and now the family heirloom has gone missing. Honey suspects it was taken by one of her best friends. She sets out to find the necklace before her mother notices it’s gone. Along the way, Honey meets Shiver, who turns out to be much more than the owner of the newest popsicle shop in Sleepy Hollow. 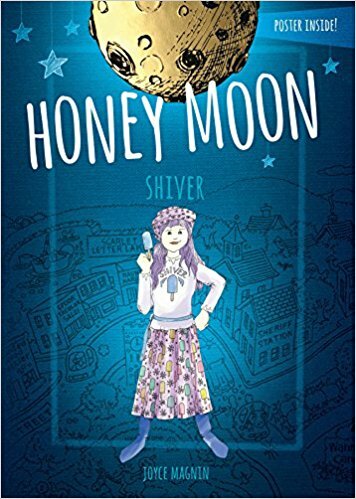 With Shiver’s guidance and a bit of magic, Honey is able to track down the locket and learn the importance of telling the truth and the power of forgiveness.